- Each 4th Round is LIVE and time-limited! The less experienced get more time! It's gr8 fun and adds real pressure! - Rally Incidents; each driver will suffer an incident/failure. Nobody fails to finish a stage. Once everyone has an incident, the system resets and restarts. It's random and a sliding scale is used, slowing the most experienced more. Times are taken from the Leaderboard. Adjustments are made afterwards. Also SFWRC-TV is used to highlight driver's laps on a rota and appear on SpeedFreaks YouTube Channel! Standings are updated after each Round, the Series is long-term. It will either run to DiRT 4 launches, or split into 2 separate Championships. A winner therefore every 6 months or so. 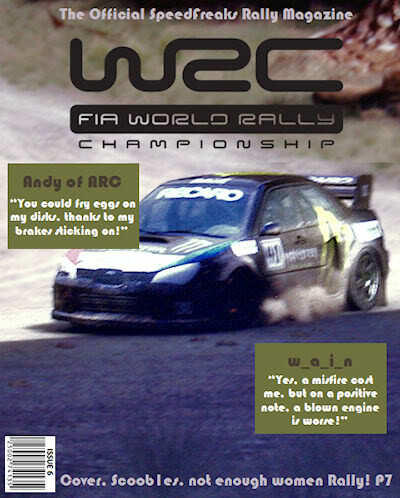 Those suffering incidents are told via the cover of our online Rally Magazine, when a 'comment' is made as if spoken them. See the example below. Thanks for reading!